Notes: Organized April 15, 1874, at No. 2 Central Av., and was in operation till June 14, 1882….Total patients treated from April 14, 1875, to Dec. 31, 1880, 2,235. Total attendance of patients at Dispensary, 14,243. The Baltimore Eye, Ear and Throat Charity Hospital, No. 186 Franklin street, opened its outpatient or dispensary department yesterday. 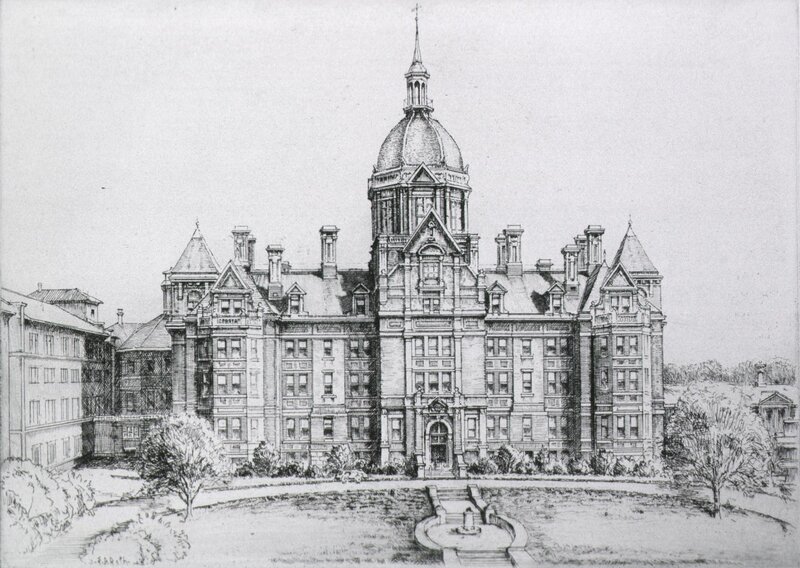 The institution is a consolidation of the Eye and Ear Dispensary of the Church Home, North Broadway, the Baltimore Charity Eye and Ear Dispensary, Central Avenue, the eye and ear department of the Baltimore General Dispensary, Liberty street, and the Baltimore Throat Dispensary, Park avenue, all of which have been discontinued. The staff of the hospital is made up of specialists formerly connected with those institutions, as follows: Eye and ear, Drs. Samuel Theobald, S.L. Frank, Russell Murdock and I. Bermann; throat, Drs. J.H. Hartman, Samuel Johnston and John N. McKenzie; consulting surgeons, Drs. Alan P. Smith, L. McLane Tiffany, Christopher Johnson and Oscar J. Coskery; consulting physicians, Drs. Samuel C. Chew, G.W. Miltenberger, Rigin Buckler and Ferd. J. Chatard, Jr. The hospital is supported by volunteer contributions, and treatment will be supplied free of charge to the poor. The in-patient department, provided with free beds, will be opened about October 1. The officers of the institution are as follows: Hon. Geo. Wm. Brown, president; John W. McCoy, Samuel G. Wyman, vice-presidents; Clayton C. Hall, treasurer; John N. Mackenzie, M.D., secretary; finance committee, Wm. H. Perot, C. Morton Stewart, Mendes Cohen, W.S. Rayner; board of trustees, John Lee Carroll, Ernest Knabe, C. Morton Stewart, Wm. H. Perot, T. Edward Hambleton, Samuel G. Wyman, Jno. W. McCoy, W. S. Rayner, Samuel H. Lyon, T. Harrison Garrett, Mendes Cohen, S. Teackle Wallis, Wesley A. Tucker, Geo. Wm. Brown, Clayton C. Hall.Source: Sun (Baltimore), 19 September 1882.